The main culprit of WordPress hack attacks are weak passwords. WordPress does auto suggest strong passwords but users can still use weak passwords. Unless password policies are enforced, users use weak passwords. The plugin Password Policy Manage for WordPress was developed with this problem in mind – it helps WordPress website owners and administrators ensure their users use strong and unguessable passwords. 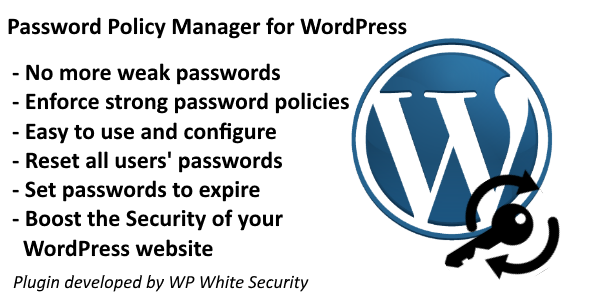 The Password Policy Manager for WordPress plugin allows you to configure password policies users must adhere to, ensuring they use strong passwords that cannot be easily guessed during brute force attacks by malicious hackers. It only takes a few seconds to configure strong WordPress passwords policies and improve the security of your WordPress website. You do not have to familiarize yourself with a new system or interface. The Password Policy Manager for WordPress integrates seamlessly within your WordPress login page and uses the standard WordPress UI. The user experience is also seamless. Users are notified during login when their password is expired and can reset it via a simple link. Boost the security of your WordPress website by ensuring your users use strong passwords! Install the Password Policy Manager for WordPress plugin.